Everyone has the one elusive Holy Grail fashion item that they’ve been searching for forever. Five minutes of asking about it on Twitter and I’m inundated: from vintage Missoni cardigans and a clear mac to a classic trench coat, it seems that everybody is looking for that perfect addition to their wardrobe. Stylist Frankie Murray is after black platform heels which aren’t too high with a thick heel, Sara from Daily Polish is after some specific Louboutins and has been searching since 2007 and Lyndsey from Be Gorgeous is, like many of us, searching for the perfect pair of skinny jeans. 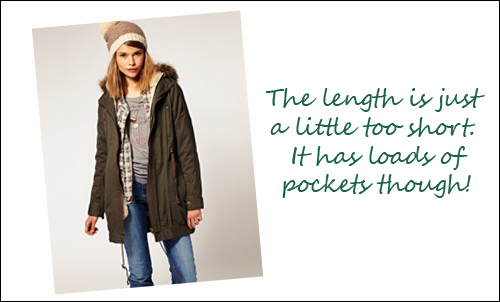 I have my own fashion unicorn – the perfect parka. I have been searching for years, I’m not even kidding! Though they always come in and out of ‘fashion’, I think they are an incredibly versatile wardrobe addition. They are spot on for dressing down a little dress on a night out, toughening up a girly outfit or just throwing on over a casual, dressed down outfit. 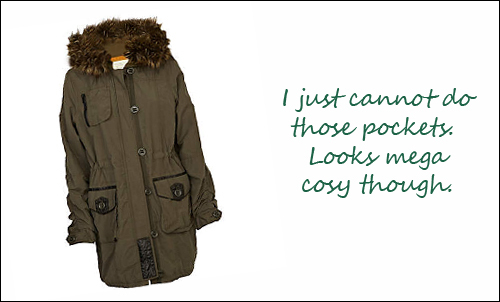 I’m not after anything special, just a long length parka with a dipped hem in khaki green with an oversize fur-lined hood…oh and it must be fairly warm. 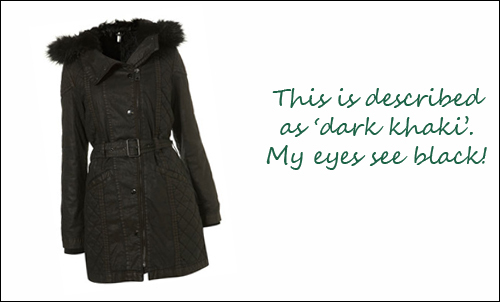 I did come close to the perfect parka once; it was by Theory at House of Fraser. 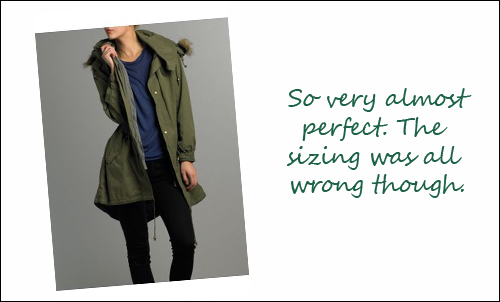 It ticked all of the boxes but it was just too oversize, the smallest size absolutely swamped me. Here are some of the parkas I’ve found which are close…but not close enough. If you see anything you think may be the parka, do let me know. I’d also love to hear what your Holy Grail items are. Maybe we can set up a support group?! LOL at the "dark khaki!" I'll keep my eyes peeled for you! Ahh it's so hard to find the perfect item! I always feel the same way too everytime I'm hunting for a new item. Haha.